Priority Zone is a public-private partnership between eThekwini Municipality and Drake & Scull Facilities Management (DSFM). Together the initiative runs a 24/7 integrated service-provision model in the "Facilities Management Priority Zone" (FMPZ), for eThekwini Municipality. The purpose is to transform Durban’s inner city from a crime and grime-ridden area into a pleasant experience for all. 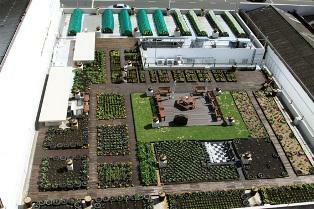 Priority Zone headquarters is home to a rooftop garden which features a vegetable garden and wormery. This is wonderful - pity not many of us locals know about it. Is it open to the public? Well done on a fantastic and inspiring job. I really wish I was a Durbanite I first proposed the idea to Mgungundlovu District Municipality in 2008, everyone concerned looked at me as if I was high on some green stuff. Sure enough, I may have been a frequent flyer of the cannabis airline, but 'God save the Queen', the idea packed lots of merit. Thanks Priority Zone for vindicating the idea, hopefully, this infinitely sleeping and largely rural tiger (Pmb) of KZN will eventually catch up in the next century from now. Liz May 2012 "Looking into vermiculture for my garden"
Imagine Durban May 2012 "Wonderfully inspiring roof top permaculture"